(TibetanReview.net, Jul20, 2018) – A district court in the Czech capital Prague will retry a case in which a Chinese couple used violence to wrest a Tibetan flag from a Czech woman and threw it into a nearby river during Chinese President Xi Jinping’s three-day visit in Mar 2016 following a Supreme Court ruling, reported praguemonitor.com Jul 16. The use of violence, the wresting away of someone else’s belonging, and the violation of a protester’s right to express her opinions on the Tibetan issue were the elements in the appeal which prevailed upon the supreme court to annul the district and municipal court decisions in the case. Those courts had ruled and concurred that the couple from China had committed no crime because the flag was of a small value. But Supreme Court Attorney Pavel Zeman was reported to have argued in his appeal that the property motivation was not necessary in the crime of robbery and this was why the flag’s value was not crucial in the case. The report cited Supreme Court judge Vladimir Vesely as having ruled that the crime of robbery may have been committed in this case. “According to the stated circumstances, the defendants … used violence against the damaged woman with the intention to take possession of a thing of another – the Tibetan flag that she was pressing to her body,” Vesely was quoted as having written in his ruling. During Xi’s visit, there were reported to have been skirmishes between supporters and opponents of the Chinese regime. 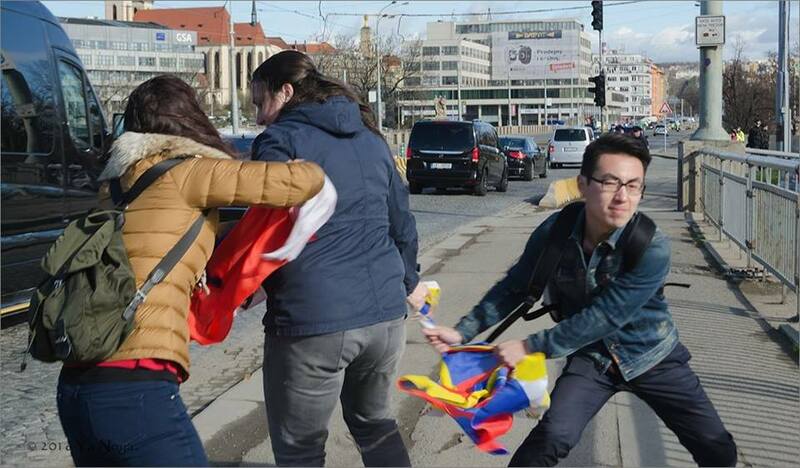 In one of them, a Chinese couple attacked a female protester who was carrying a Tibetan flag which they eventually wrested away after grappling with her and threw it into the nearby Vltava (Moldau) River. The lower level courts were reported to have concluded that the couple from China had committed no crime because the flag was of a small value. They had therefore sent the case to the municipal authorities to check whether a minor offence had been committed. But Zeman, in his petition for an appellate review, has pointed out that the Chinese had used violence against the female protester in order to take the flag away from her. Moreover, the action was politically motivated and they violated the protester’s right to express her opinions on the Tibetan issue, he was stated to have argued. The report said the case will now return to the Prague 7 District Court for disposal in accordance with the direction of the Supreme Court. The trial is planned for August 13, Prague 7. I’m involved in the case, as a witness photographer. And it was my flag, lent to the woman. Thank you for sharing the correct photograph. 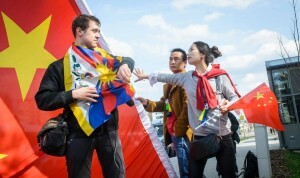 The flag cost might be cheap but snatching a Tibetan flag from a somebody is a big crime. This is a Tibetan national flag. It’s not a normal stuff. That Chinese couple hurt millions of Tibetans & Tibet’s supporters hearts all over the world. We are suing them for the crime action, disrespected to 6 million Tibetan people & countless Tibet’s supporters but not for the value of stuff. Please give them a biggest punishment that everybody can satisfied. Hello Norsang, yes, the issue of a material value of the flag itself would not lead this case to this type of court.